If you’re the kind of casino player who likes to gamble with a tried and trusted name in the business then Betfred is a good option for you. They are one of the largest independent bookmakers in the UK, from humble origins as a single shop that opened in Salford in 1967. Whilst the main casino site is powered by Playtech, they do not have exclusivity over game provision to Betfred players so if you join we recommend heading over to the Vegas and Games sections of the site where you can also enjoy slots from Microgaming, BTG, Yggdrasil, IGT, Blueprint, Ash Gaming, Realistic and Boss Media. That gives you a pretty tasty selection of game titles to choose from. Elsewhere there is also a good selection of payment options, including Paypal, Neteller and Skrill, and withdrawals are processed within 24 hours, mostly much quicker, and at weekends too. You can join now and take advantage of a 50 free spins sign up offer (with no wagering requirements), or read on to find out more about this top UK slot site. Playtech is one of the world’s biggest slots suppliers, so there is a mountain of games to choose from. Amongst their best are the Age of Gods Slots, like the 2018 release, Ruler of the Sky. Also to look out for is the entire Marvel Comic Book series, including many Batman and Catwoman slots, the Incredible Hulk, Fantastic Four and Iron Man 2. To find a broader slection of games you can dip into the Vegas and Games tabs on the Befred site where you will find slots from more suppliers. Here there are titles from Microgaming, including Immortal Romance, Thunderstuck II, and Diamond Empire; Yggdrasil – Vikings Go To Hell, Tuts Twister and Lucha Maniacs; Blueprint – Diamond Mine Megaways™ and Irish Riches Megaways™; Big Time Gaming – Book of Gods, Bonanza and Donuts; NextGen – Foxin Wins. Betfred Casino are keeping it simple when it comes to the welcome package on offer. You get 50 free spins to play on a selection of Playtech slots. To claim this bonus you just need to deposit and stake £10 or more on slot games over 5 or more separate spins. You must use code SPORTS60 to qualify for this bonus. Only spins on slots count towards acquiring the bonus. There is a long list of slots that are eligible to play free spins on. Check the site for full details, but it includes the full Age of Gods series, Frankie Dettori and Halloween games. Winnings are received as cash with NO WAGERING REQUIREMENTS. You must ACCEPT your free spins from the pop up when you have qualified. Sound good? You can sign up right here. 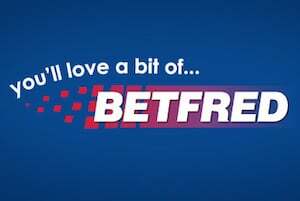 Betfred are a well-established name on the UK gambling scene and with years of experience they have a strong promotions and loyalty team, with regular bonuses, cashback and free spins offers for existing customers. You can enjoy offers like Game of the Week, granting you double loyalty points for money staked on the chosen slot. Loyalty, or Comp points, are granted for all your gameplay on the casino. There are four levels – Base, Bronze, Gold and Diamond, with improving exchange rates from points to cash at each level. Like all the big bookmakers who run online casinos, Betfred has a wealth of deposit and withdrawal options, all of which are free. You can use the debit or credit card option – Visa, Mastercard or Maestro – or any one of a number of eWallets, including Paypal, Skrill and Neteller. The withdrawal times at Betfred are very favourable, with a guaranteed maximum processing time of 24 hours. If you are someone who finds it hard to resist reversing that withdrawal whilst you wait for it to be processed then Betfred could be a good option for you – you CANNOT cancel a withdrawal request once it’s done! As always, we recommend that you verify your account as soon as you can after registration in order to speed up the withdrawal process. You can do this through your account page or through the support team. Another reason that we recommend Betfred to Slot Buzz readers is their strong customer support reputation. Outside of the extensive FAQs section of the site there is also the option to contact the team via Phone (0800 028 7747 in the UK), Email (support@betfred.com)and Live Chat. Response times are generally very quick, as you would expect from a top tier sportsbook. The Betfred name is owned by a company called Petfre Ltd, licensed by the UK Gambling Commission and the Gibraltar Gambling Commissioner. This means that their games and their platform are fully audited for fairness, safety and security.